How was your stay in USA? Did you go there for recordings? I was there just to put myself about, to have a holiday and to see a lot of old friends. You recently toured with Emily Burridge. What was the feedback you got from fans for this tour? The tour was very good. This was before I went to Nashville. We were playing in very small village halls, little social clubs and things like that and it was very very good. We got to local communities and they really liked what we were doing. The classical stuff. Did you try anything for the first time during the recordings of “Into The Blue” album with Emily Burridge? Yes, we tried a few things. We did a full set of eerie sounds. “Transparent Music” has a great cult status. How important was this album for your solo career? My solo career started many more years ago. My very first album was called “New Hovering Dog”. Yes, I know in 70s. The “Transparent Music” was the first one I obviously did synth things in 1989. I really discovered the ambient music thing. Some of the most impressionist things and I got to play that stuff. Very important. I would say it was a quite good album and it was done for Joe Boyd from Carnivore Records. It sold about 10.000 and it was quite good, quite healthy for a solo one. It gave me a lot of encouragement to go on and do some serious solo albums. In general, are you satisfied from the recognition your solo career has? In general, I would like to be. It was very difficult to concentrate on my own projects, you know I usually do recording sessions for other artists as well, which is my main career. I would like to have time to concentrate on my own projects, which is the plan to do in the future. How you started playing pedal steel guitar? Are you self-trained? Pretty much, yes. I discovered the instrument. I just loved the sound of it. I played guitar to start with, for several years and then I heard the pedal steel , the steel guitar generally through a record of Santo & Johnny called “Sleepwalk” , that was in the early 60s and that record got me convinced about steel guitar for myself. And it took over my life. Do you think the recording of Elton John’s songs “Country Comfort” and “Tiny Dancer” was a catalyst for you later career? First of all, I didn’t play on “Country Comfort”. It was Gordon Huntley on that. Gordon Huntley was kind of godfather of British pedal steel. He’s already here. I played on “Tiny Dancer” and yes absolutely it was a catalyst. It was the track that make aware everybody of my playing to the whole session scene in UK. Everybody wanted me to play on their records. Obviously, that record (“Madman Across The Water”) was such an important for Elton. Generally it was an important record I think. You worked very closely with Steve Marriott (Small Faces, Humble Pie). How was he as a person and as collaborator? (Laughs) Quite a character. Great character. When you were working with him one to one, he was delightful, very thoughtful and a nice person to be with. But was he was in a social situation, he changed completely into a party animal. And I think you know what I mean. You played in classic Trapeze’s album “You are the Music, We’re Just The Band”. Do you think it was one of the best albums you have played in? I did. Many years ago. Musically it was one of the best sessions I did at that time, generally. It’s something so long ago now to evaluate how it fits in my career. They weren’t a well-known band in these days. You know about it, and people in business know about it, but it’s not known as “Tiny Dancer” for example is now. Because Elton John is still you know..
No, I don’t listen to it. I try to forget all about that. Marc Bolan was very successful . But I don’t have that album now. I don’t necessarily collect the albums that I play in. Do you have happy memories from Marc Bolan? How was he? He wasn’t there. Well, he was there. He was asleep in the corner. All I remember was Air Studios and Tony Visconti (huge record producer of David Bowie, T.Rex and Lou Reed). Quite often these artists, weren’t there. Tony Visconti was there. He produced it. I enjoyed a very good relationship with Tony Visconti in many sessions. Including Mary Hopkin, his wife. How scary was recording with Jerry Lee Lewis during “The Sessions”? (Laughs) It was quite scary because he was carrying a gun around! So, it was quite scary. You have worked many times with Scott Walker. I’m a huge Scott Walker fan. Do you think he’s one of the most visionary persons in modern music? He brought you even in Walker Brothers’ “No Regrets” album. Scott Walker is the best singer I’ve ever worked with! And “No Regrets” is fantastic! I worked in two albums before that. I did a session with him again, three months ago for his new record. (ed:I started screaming right now for the scoop I got). But his new records a very difficult to listen to them. Where he ‘ll use it, I have no idea. He is almost like always testing his audience. If his audience can follow his avant-garde thrill. He’s a very nice guy. It was lovely to see him again. Yes, I know. But it is impossible to find him (A kind of J.D Salinger of rock’n’roll). When you do, he’s a very nice man. He’s a bit very close. Were you surprised that a so successful artist, as Robert Plant is, still remains a passionate music lover? Robert Plant is in a very good position at the moment. He is having discovered country music. He got a new career again. He created a new market for himself. He has new energy and his in a very good place at the moment. When I was in Nashville, I met some from his band and they are very proud of working with him. Did you enjoy the sessions for David Gilmour’ s “On An Island” album. Were these sessions strange for you as David plays steel guitar too? I done that thing with David some years before the album came out. We got together for a bit of a jam session in his home studio. On the boat, the Astoria or at his house? I know the boat. I went to this home studio in Sussex. We just got together socially to do some things and we come up with this tune and he used it in his album. That’s how I’m in it. I didn’t work on the boat with him. It was something already done some years before and he decided that he liked it. Did he ask you anything about steel guitar, because you’re the teacher and he plays too? It’s interesting because he plays steel guitar himself. He liked my playing. The thing is I had known him since the early 70s because of my band Cochise I met him. He comes from Cambridge and few people from Cochise had worked with him in various bands. So, he’s one of the people I got to know because of Cochise back in the early 70s. What memories do you have from Roger Waters’ “Amused to Death” album? I’ve talked with Rabbit (The Who keyboardist) and he was very excited about this album! (Laughs) I don’t have too many memories. It was a session at his house, he was living in South or South West London at the time and I remember the engineer-producer, it was Nick Griffiths. He was very good friend of mine. Unfortunately, he left us some years ago. Because of Nick, I came down and played. 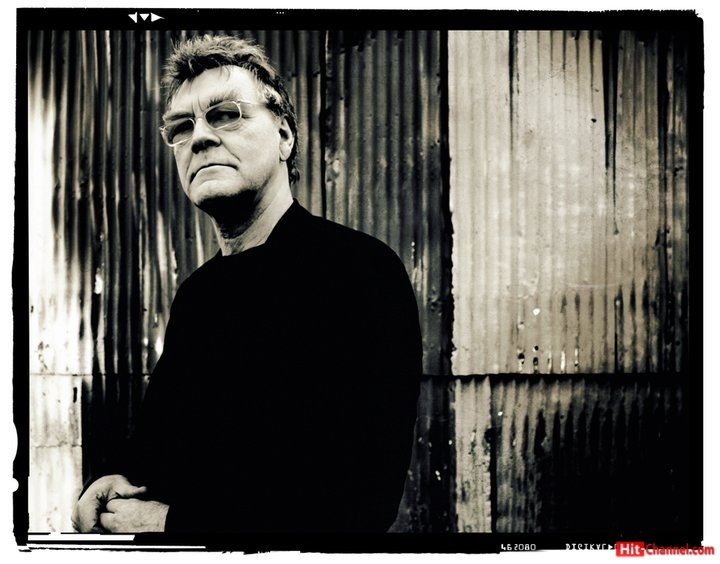 Nick Griffiths helped me with some of my solo albums and obviously he worked on “The Wall”. I got on well with Nick and he brought me to “Amused to Death” record. Yes, I remember that session. Was Jeff Beck is that session too? I was on an overdub session. I have met Jeff Beck a few times. I have the outmost respect for him because he is one of the greatest guitarists. How comfortable did you feel when you played in Depeche Mode’s “Ultra” album? Were you familiar with their music? Ok. The guitar player was a fan of country music and he had a particular album that is a favourite of mine by Ray Price. We had a long enthusiastic conversation I remember about Ray Price and his band and I felt really good about working with them. Because they were fans, you know. That’s always the case when I work with people, if they show that they are fans of music, I always have a good time. With R.E.M was like that. I liked that, they were very enthusiastic. Peter Buck especially I think. Yes, that’s right. Yeah.They were great to work with. They are as big as they are. They were humble in a sense. One of the last albums you recorded was Tom Jones’ “Praise and Blame”. How was working with Tom Jones? I think he named you B.J..
Steve Marriott did. It wasn’t Glyn Johns. No. Is there anyone you’d like to play with and hasn’t happened yet? Richard Thompson (Fairport Convention). He’s great, I’d love to work with him. He’s such a great guy, I ‘d really like. Oh, Jeff Beck will be good. I’d like to work with Prince. I know Prince isn’t good as he used to be, but I think he’s still one of the greatest musicians of all time. I don’t know. I have never made a lot. (Laughs) I’m recently famous but I have never made a lot of money. I’m still trying. I mean, observing the others being rich and famous. Ok. Yes, I think. I think Elton did change quite a lot. I know him before he became famous, so I was there to see him changing. You have done rock, country, electro, classical and ambient albums. In which style do you feel closer? At the moment, I’m enjoying the classical music with Emily. It’s the direction I’d like to take in the future because first of all the pedal steel works very well in that kind of music and it’s something that to the public seems to be exotic and there is a lot of potential for music to play. Classical pieces that the pedal steel guitar adds something greatly too. It’s very fulfilling. I just realized that you and Albert Lee (Emmylou Harris, Eric Clapton) you’re the only English musicians who has a country career in the USA too. This isn’t very common. The thing is Albert had to go to America to become a great country musician. Because there is no living to make being a country musician in the UK. He had to go to America to work with Emmylou Harris, to get a reputation, to be free to make a living as a country musician. I never left London. The thing is I was very busy doing sessions in London with Elton John, Sting and everybody else and I managed to work with singer/songwriters, so I don’t regard myself as having done a career in country music, although I do like playing country music. What music do you listen right now? I’m just back from Nashville . A few new CDs which I was very excited about. The new Ry Cooder CD , it’s very fine. And a CD I found from Tennessee Earnie Ford from the early 50s. It is radio shows, which is something I’ve very excited about that. I’ m listening to all sorts of music. Absolutely everything. I like everything that gets my attention.I like Olivier Messiaen, the French composer. This composer likes to Radiohead guitarist Jonny Greenwood. Ah, Jonny Greenwood. I haven’t heard a lot of his music, but I think he’s great. It’s good the musicians from Radiohead and from other bands, are starting to become established as serious composers. It’s great people like that, crossing the borders. That’s what my ambition is to do it for myself. Do you like ambient composers like Klaus Schulze? Yes. I know Brian Eno, particularly well. Currently, I’m working on a project of the perfoming of “Apollo” written in 1983 by Brian Eno, which was commissioned to be with the film that was shot from the Apollo mission in the 60s. It is arranged to be performed by a live ensemble. I’m playing the Daniel Lanois (U2, Neil Young producer) steel guitar part. I have been doing many concerts with that one, and this will continue over the next two years. Hopefully, we could come to Greece with that. It would be nice to come over there. It would be great. I don’t know if our pockets could afford that … Had you ever met Robert Fripp (King Crimson leader)? He’s a genious! Yes, I know Robert Fripp. We worked in an album with David Sylvian. I met him in one or two occasions. He’s quite eccentric to meet. I think he’s a great guitar player. Have you ever been in Greece? Oh, I love Greece. I go on holidays in Greece. I go to Cyclades and particularly in Naxos. I’m a big fan of Naxos. I love Naxos, it’s such a great island. I remember doing a gig in Athens with my “Trouble in Paradise” project. I was with a D.J I ‘ve been working with, Bit Bailes. The tour got to Athens, doing a club gig, which was very enjoyable. My favourite place to go on holidays is in the Cyclades, yes. A huge “THANK YOU” to B.J Cole.